Found in Majula, sitting in front of the monument just past the first bonfire. 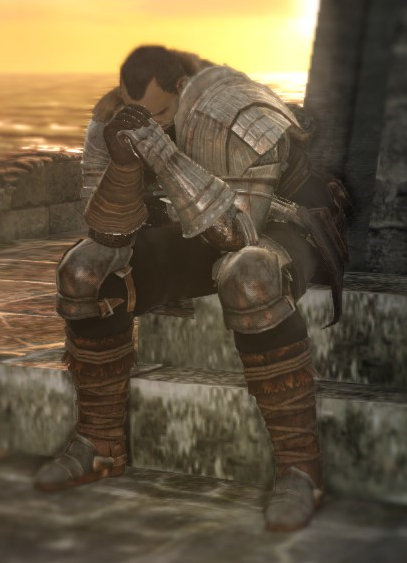 Similar to the Crestfallen Warrior in Dark Souls 1, Crestfallen Saulden provides some useful information for early on in the game. Leader of the Way of the Blue covenant. Gives the player a Ring of Steel Protection when talking to him after dying at least 100 times. After getting Melentia, Licia, Rosabeth, and Chloanne to Majula, he will give the player a Soul Vessel. Introduces players to the game and invites them to the Way of the Blue covenant.